How to flip your video? If you recorded a video clip using your mobile device, you may notice afterwards that the video has been filmed upside down. This can be easily fixed by vertically flipping (mirroring) the video image. Horizontal flip can alter the perception of a scene in your movie. It is considered that horizontal movement in a picture can show the passage of time. E.g. if characters move across the screen from left to right, this indicates that they seek to achieve a goal. Movement from right to left evokes the feeling of the return back. 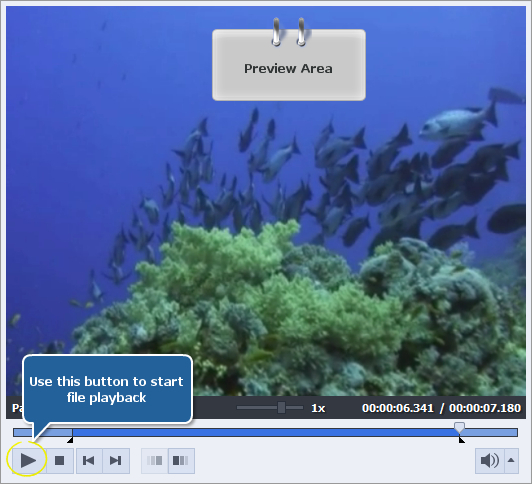 AVS Video Editor is an easy-to-use software that allows you to flip your videos both vertically and horizontally in a few clicks. After you import your video into the application and add it to the timeline, please follow the steps below to flip your footage. The Flip effect allows you to mirror the entire video image horizontally or vertically. 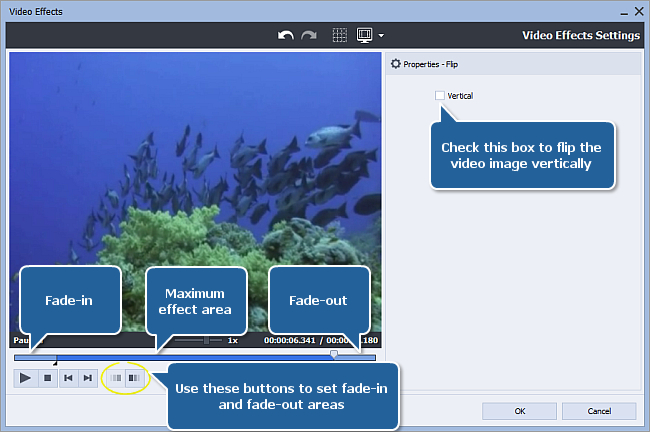 Press the Video Effects central button within the main window of AVS Video Editor. All of the available effects will be displayed within the Files and Effects Area. 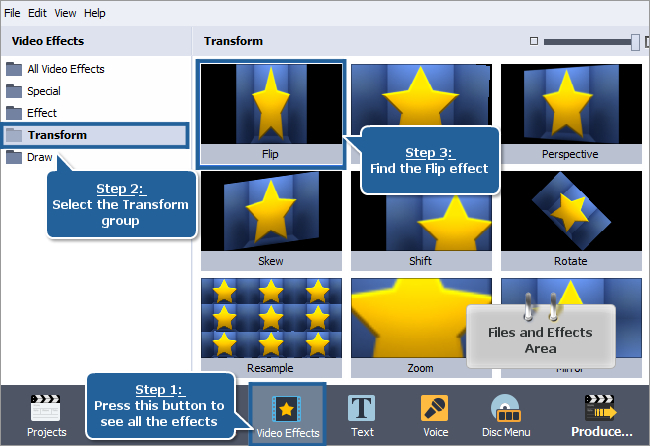 To find the necessary video effect more easily, select the Transform group from the effects groups displayed on the left. 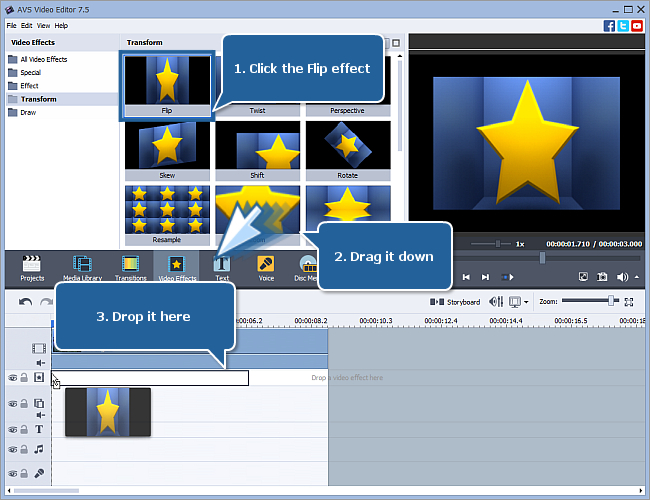 To add the Flip effect to the timeline, right-click it and choose the only available option of the express menu - Add or Replace Video Effect. After doing this, the effect will be displayed on the timeline. Alternatively, you can simply drag-and-drop the effect to the Video Effects line of the timeline. 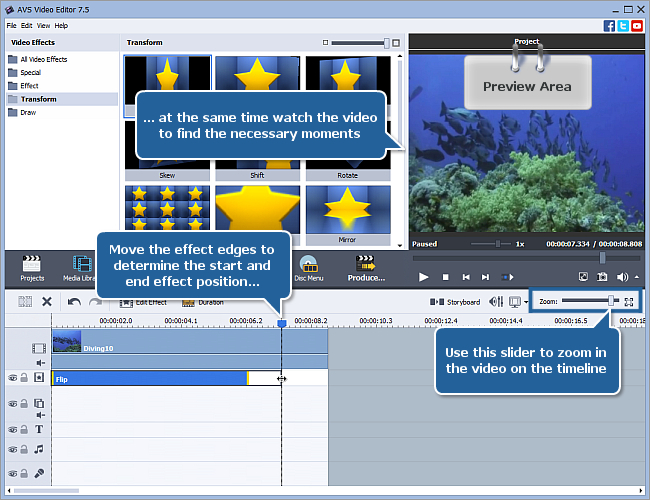 The Flip effect is now placed at the current cursor position on the timeline and occupies the standard room within the video effects line. Whether you want to apply the effect to the entire video or to its certain part only, you might need to change the effect duration. To do that quickly and easily, just drag the effect boundaries. Hover the mouse pointer over the left effect edge until it turns into the bidirectional black arrow and drag it to the left or right without releasing the mouse button to find the beginning of the scene you want to apply the effect to. While moving the arrow, have a look at the Preview Area. As soon as you find this certain moment, release the mouse button. Then do the same with the right effect edge to find the moment, when the necessary scene ends. You can use the Zoom slider to zoom in the video on the timeline in order to find the exact moments easily. The only property of the Flip effect available for setting is the Vertical option. The horizontal direction is set by default. If you'd like to flip the image vertically tick the Vertical option. To make the effect gradually appear and disappear in the video, click with the mouse within the blue bar shown in the figure below and press the button. Therefore, the Fade-in area will be marked. To set the Fade-out area, click with the mouse in another place and press the button. Now you can preview your video with the applied effect to make sure you got the necessary result. Please, press the button within the Preview Area of the same window to start playback. That's all. You have just successfully applied the flip effect to your video.